Check it out -> FujiFilm uses KeyboardLocker to protect all of their photo kiosks! Have you ever hosted a table at a conference or a trade show, and had to keep on re-running your laptop’s presentation because people kept on mashing on your keyboard and quitting out of it? Unique, but troublesome, circumstances such as these call for unique solutions, like today’s discount software promotion, KeyboardLocker! KeyboardLocker disables the keyboard while leaving your mouse active, ensuring that your presentation, demonstration, critical process, or attract mode remains undisturbed. With KeyboardLocker, you don’t have to worry about someone interrupting your laptop, and resuming control over your system is as easy as remembering a special phrase. Not only can you use KeyboardLocker to disable the keyboard, you can also use the program to secure dedicated servers, prevent keyboard input on Internet and Photo kiosks, and protect running processes from accidental disruption. Best of all, you can have your computer start KeyboardLocker automatically upon boot, or just use a quick press of Ctrl+Alt+L to launch the program! After you purchase KeyboardLocker it may be used indefinitely. KeyboardLocker is licensed per computer, and not per user. Sascha Tuberkel For my own interest I googled various options and alternatives. I found this Freeware. "Kid-Key-Lock 2.2"
Kid-Key-Lock is a simple application you can run to lock specific or all keyboard or mouse commands, and choose a release password. 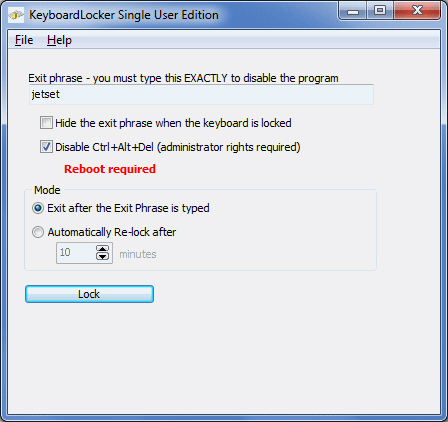 Simon Carter KeyboardLocker allows control over Ctrl+Alt+Del, which is not normally possible. Perfect for kiosks! Alexander Deliyannis Hi, just a clarification: I read that "KeyboardLocker disables the keyboard while leaving your mouse active" so I assume that one can only display full screen applications safely. If the mouse is active and the Start menu is visible, then there is no limitation, correct? Kenneth Bates I purchased a licence for today's offer but failed to get an Activation Code. I have tried to download the trial version but my 32-bit version of Windows informs me that it is unable to load 64-bit software. Firstly, please tell me how I get the 32-bit version and then explain why I can't get a licence for it. My Order No. is 17957225. Incidentally, I did check on Avangate's website and they confirm that the whole transaction is complete. Simon Carter @Kenneth: Hi Kenneth - your login has been resent, and we will investigate and fix the x32 issues first thing Monday morning. Simon Carter Just released v3.6 to fix the install issue under x32 Windows. VLM Is the Ctrl+Alt+L shortcut customizable? I mean, it is using Hotkey Commander or the like, but can it be customized from within KeyboardLocker? Kenneth Bates Hi Simon, Many thanks! Your resent email has not arrived yet but I shall remove the old copy of KeyboardLocker in anticipation of loading the updated one. Shall keep you posted. Simon Carter @VLM: Yes, this is just set on the short cut in the start menu, and is easy to change by right-clicking it. VLM Thanks Simon. So press ctrl-alt-L (or whatever shortcut one chooses) to lock and unlock, and on unlock enter the unlock code/password. Correct? Simon Carter @VLM: No, press Ctrl+Alt+L (or whatever) to lock, and from then, only typing the unlock password will work. VLM Ohhhhh ... So NOTHING about the keyboard being locked becomes visible until one types not only SOMEthing, but the correct thing. If this is correct ... NICE!! !